Advantage: Starting by selecting the date and time enables you to quickly see whether the new item is in conflict with existing items. Advantage: If you select a specific date and time, the New Appointment form automatically uses that date and time as the starting point for the item. You can easily change the date and time, but you won’t have to if the date and time are already correct when you begin creating the schedule item. Disadvantage: If you’re setting up an event that’s far off in the future, navigating to the correct date may be a bit of a pain. Disadvantage: If the new item conflicts with an existing item, tapping the time of the new item opens the existing item rather than opening a new appointment form. Events conflict with each other if they share some of the same dates and times on your calendar. For example, an all-day event like a birthday would conflict with a dental appointment at 10 a.m. on the same day. Begin by entering a subject for the item. You can select a subject from the drop-down list, as shown in Figure 1, or you can enter a new subject. Figure 1: Make sure that you pick a subject that’s easy to understand. Generally you see only the event’s subject in the calendar, so picking a subject that’s clear enables you to understand your schedule with a quick glance, even after you’ve added a bunch of things to your calendar. After you’ve specified the subject, you can add a location for the event. Including a location isn’t always necessary because some events simply don’t require you to be in some particular place. A good example is if the event you’re adding is someone’s birthday. In that case, the location doesn’t matter. You also don’t need a location if you’re listing something like a phone call you need to make. The point is, you can leave this field blank. Now it’s time to set the times for most events. You don’t have to worry about times for some all-day events like birthdays, but in most cases, you want both a starting and an ending time. To set the dates and times, tap on the date or time you want to change and either type in the correct information or select what you want from the item that drops down. As Figure 2 shows, if you tap one of the date fields, a calendar drops down. If you tap a time field, a list of times appears. Figure 2: Choose the correct beginning and ending dates and times. 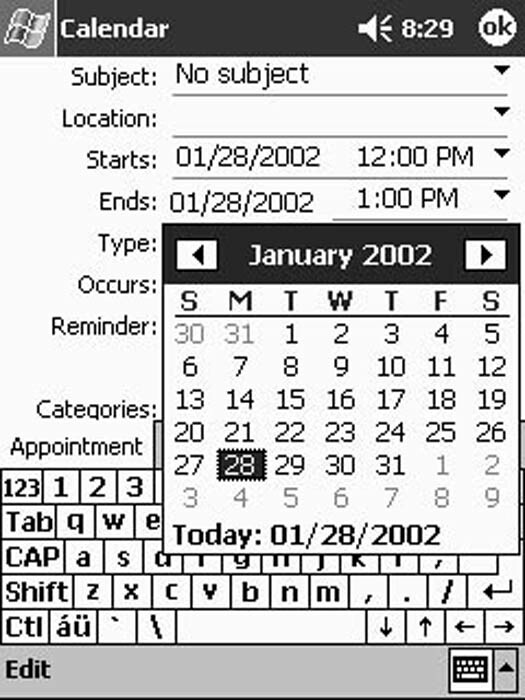 The Pocket PC calendar recognizes two types of events: Normal and All Day. Choose Normal for events that have a beginning and ending time; choose All Day for events like birthdays that don’t have specified beginning and ending times. You make this choice in the Type field. Your definition of an all-day event may differ from your Pocket PC’s definition. In the Pocket PC’s definition, an event that is all day begins at midnight and ends at the next midnight. Don’t try to use All Day as the event type for things that really do have a beginning and ending time — such as a training class that lasts your entire workday. If you do use All Day, your Pocket PC doesn’t warn you if the scheduled event conflicts with other items on your schedule. The next appointment field is the Occurs field. Use this item to specify events that happen more than once. For example, if you have a regular staff meeting every Monday morning at 9 a.m., you need to set up only one occurrence of the meeting and then specify when it repeats. Your Pocket PC offers several common types of patterns to make it easy to set up recurring events. 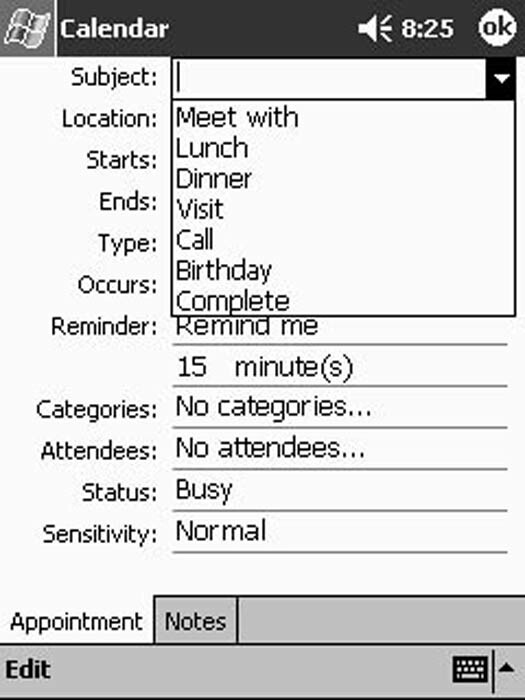 If you keep different types of events in your Pocket PC calendar, you may want to select categories for those events. Just tap the Categories box and choose the appropriate categories for the event. These are the same categories that you use to organize your list of contacts. Your Pocket PC helps you set up a meeting that you’re scheduling by sending a message inviting each of the proposed attendees. To select attendees, tap the Attendees box and then select each of the people you want to notify. Your Pocket PC sends an email message to each person with all the details you’ve included while setting up the event in your calendar. The Status drop-down box offers four different choices to handle a range of possibilities: Free, Tentative, Busy, and Out of office. You can probably figure out quite easily which one fits any event you’re scheduling. You can specify that an appointment is a private event by selecting Private rather than Normal in the Sensitivity box. On your Pocket PC, the only real effect of this change is that if you choose to, you can flag private events with a little key icon. You may notice that in addition to the Appointment tab, the form you use to create a new calendar item also has a Notes tab. You can use this tab to create a note that is tied to the appointment.